Wargrave Local History Society's March meeting began with the AGM, when the past year was reviewed, a new committee elected, and details of the 2016-17 programme given. Following the formal part of the evening, John Fryer entertained the meeting by sharing some of his memories of people and events from Wargrave's past, from the pre-war period through to the 1950s. The youngest of 4, he was the only one interested in 'the river', and would go to Bushnell's boatyard, where a boat could be hired for 2/6 an hour - if John did not have the money for this, he would be allowed the use of a boat in return for cleaning 5 of the punts! He thus got to explore the river - mainly the Loddon, rather than the Thames. During the war, Len Bushnell's yard made some high speed craft for use by the RAF. He was invited to ride in one when the government inspectors came to test it. By the time they reached the St George and Dragon, the boat was 'motoring', creating wash over both banks. When John was asked what he thought of the craft, the inspectors clearly thought speed more important than the banks! 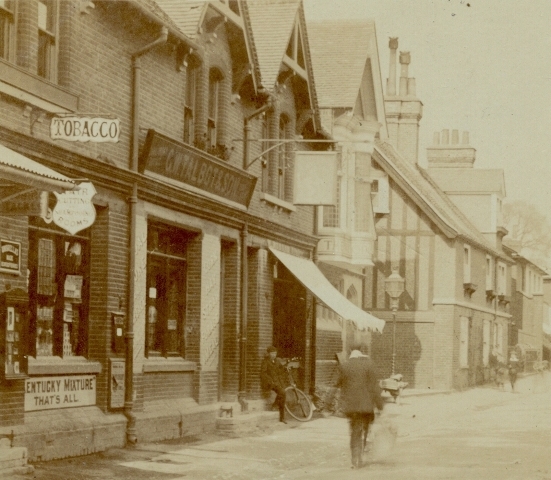 He recalled a time when it was safe to walk from the village to Henley, or to leave a baby in its pram outside one the many High Street shops, such as fishmonger, butcher, tobacconists, etc - the last mentioned being Charlie Lunn's, where he probably bought his first cigarettes. Some of the range of shops that were available in the High Street. On the far left is Charlie Lunn's tobacconists, where the white shield-like sign says "Hair Cutting and Shampooing Room" (where John mentioned he had his hair cut). Talbots, next door, were the coal merchants. Easterlings were "the firm", whether the task was for people to be "married, buried or rebuilt", John said. 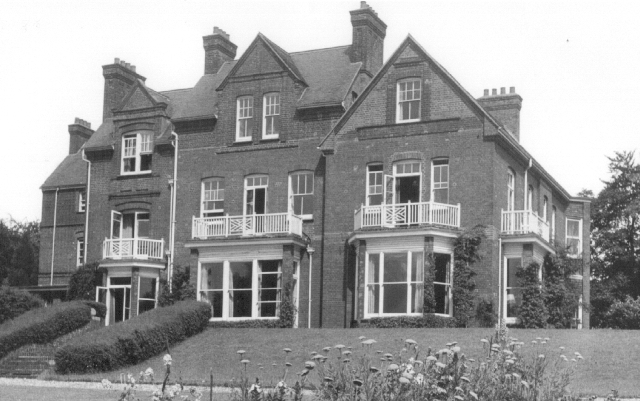 One particular task they were involved with was at Hillands, which had been standing empty for some time when it was bought by John's father. The architect 'made history' by taking off 17 bedrooms from the large house - without removing the roof above. 24 one-ton jacks were placed in holes around the building, so that they took the strain of the walls and roof above. The bricklayer then worked his way right round the house, taking out one layer of bricks. He then worked around the jacks, lowering each a little at each stage, until the process could be repeated for the next layer of bricks, and so on. The photo on the right is the house after this operation. John delighted the audience with tales of several village personalities - of some who could down a fair few pints, of a vicar who always preached the same sermon at Christmas - "Christmas is a children's festival" - or, as a schoolboy, meeting Sir Ernest Cain whilst out walking one day, and being invited to afternoon tea at the Manor, to meet Sir Ernest's daughters. John also recalled former village doctors - if he went for an injection to be given by Dr McCrea, the doctor's hand would be shaking as the syringe came towards the skin, but somehow always went straight in to the exact spot. John also recalled that on one occasion his family needed to contact Dr McCrea's successor, Dr Black. In those days, all telephone calls were connected by an operator - at that time the exchange being near Wargrave Motors. The operator said it was not possible to contact Dr Black tonight - "He's having dinner with the Wyatt's"!! The next meeting will be on Tuesday, April 12th, when we will welcome Ann Smith to speak about 100 years of Reading Shopping, and then on Tuesday May 10th, Valerie Alasia will give a talk on Henley's Workhouse.